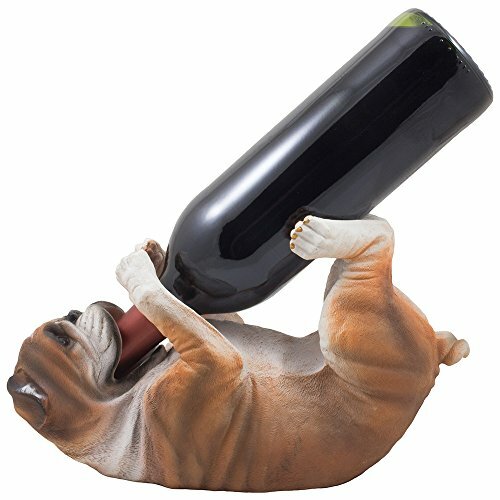 Playful yet protective, the beloved English Bulldog is realistically rendered here as a handy wine bottle holder. Set this beautifully carved sculpture on your bar or counter and you have an instant conversation starter with your party guests. What a clever way to show off your favorite bottle of wine! This decorative dog wine bottle display stand will also accommodate oil bottles and standard size liquor bottles. Makes the perfect Christmas or Birthday gift for that bulldog lover on your shopping list. Playful yet protective, the beloved English Bulldog is realistically rendered here as a handy wine bottle holder. - See full description below. Dimensions: 10 7/8" x 5" x 6 1/2" high. Weight: 2.4 lbs.